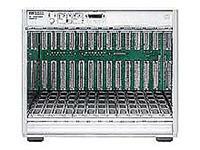 The Keysight E8404A C-size, 13-slot VXI mainframe is the high-performance mainframe in Keysight's VXI mainframe family. It delivers innovative cooling technology, improved backplane design, high reliability, easy maintenance, and versatile accessories. The power supply in the E8404A VXI mainframe provides 1000 watts of usable power, sufficient for the most demanding automated test applications. The innovative air distribution system in this mainframe provides extremely quiet and efficient cooling. Enhanced monitoring of the E8404A mainframe provides superior cooling control and details regarding temperatures throughout the mainframe, power supply voltages and currents, fans operation, system status, history queue, and stripcharts or histograms for easy diagnostics. This information is available on the full color display or through VXIbus or RS-232 connection. A front panel diagnostics connector allows continuous local or remote system monitoring. This mainframe also complies with the VXI specification by providing injector surface rails used by the QUIC easy module insertion and extraction system. Superior cooling, reliable design and enhanced monitoring make the E8404A an excellent choice for all VXI test system applications.